When we think about our favorite performers, so many burning questions come to mind. What do they like to do for fun? Where do they like to shop? Who are their favorite artists? What food do they love? Would we be BFFs? You think about all of these things, too, right?! Of course you do! So, we decided we wanted some answers and, luckily, those performers were more than happy to indulge us by sharing their road diaries. 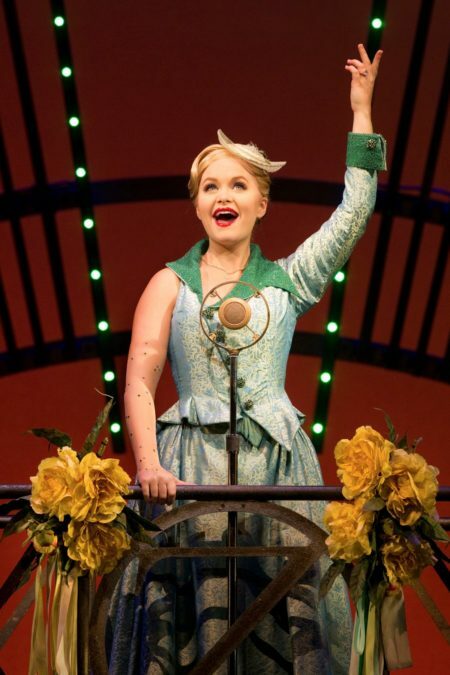 Amanda Jane Cooper plays Glinda in the touring production of Wicked, and she told us that she can't leave home without her candles, loves Grey Gardens and thinks you should invest in a S'well Bottle. Find out what else makes Cooper tick below! What do you admire most about your character? What do you love most about musical theater? The elevated humanness of it. The entanglement of story and music, the wanting of something and working through it in song, which (I believe) is a gift from above. Who is a performer who inspires you? What’s something about being a performer that no one prepared you for? The patience and trust it requires. What’s the piece of advice you’d give to young performers? What’s the one thing that has to come with you when you’re on the road? Candles! Mmm. And my phone so I can FaceTime with my loved ones. What was the show that that hooked you on theater and performing? Cats was the first Broadway musical I ever saw but I have a crippling fear of felines, so I was terrified. I’ll go with Annie Get Your Gun, starring Bernadette Peters. No cats in that one. What’s your pre-show process like? Is there something you have to do before you hit the stage? Stretching and breathing exercises, a vocal warmup, fun music playing in my dressing room, visits with my green girl and cast, and a prayer for all of us as well as the audience that night! What’s the coolest thing you’ve bought for yourself while on the road? Well it's a gift from my mom (thanks Mom! ), but it’s a pink S'well Bottle that keeps liquid at the same temperature for 24 hours. So I can take my tea with me and still have it hot when I get to the theatre. Mmmm. What’s a musical you love so much that you belt songs from it in the shower? That’s easy: ONCE ON THIS ISLAND. ALL CAPS. What’s something you’re passionate about outside of performing? I love serving/doing life with my church in Los Angeles, Mosaic. I co-lead a gospel choir there, where we hit the streets of downtown L.A. and the Metro to surprise people with songs. To me it’s not performing, it’s just sharing life. It’s one of my favorite things ever! You only get to bring one book, one album and one movie with you for a year—what are they? What cartoon character is your spirit animal? Charlotte La Bouff from Disney’s The Princess and the Frog. FOR SURE. Shoutout Jen Cody. The importance of friendships, the old and the new. Also, minimalism! I’ve downsized everything and it’s been so freeing. As my sister quotes, "stuff makes noise." There’s so much peace in purging the unnecessary. Blessed to be playing one of them! Also, I’d like to try Little Red Riding Hood again, Annie Oakley, Clara in The Light in the Piazza, the list goes on. I’d also really love to originate a role on Broadway. What’s the cheesiest joke you know? Q: What bow can't be tied? You have a day off—how do you treat yo’ self? A massage (if I’m not sleeping all day) and the best chocolate chip cookie I can find!